On Friday morning, the Employment Situation Report or Jobs Report will be released. While not the only economic report coming out this week (see Economic Calendar below), it presents the highest risk to mortgage rates and may set a tone moving forward as to which way mortgage rates will move. The report will not only give valuable guidance on the future of mortgage rates but the broader economy as well. This may mean that now is an ideal time for homeowners or potential buyers to lock in already low mortgage rates. 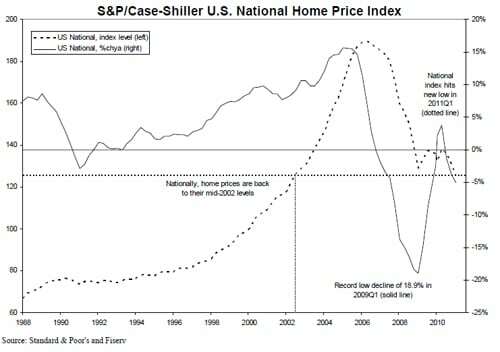 According to the newly released March S&P / Case-Shiller National Home Price Index, national home prices hit a new low in the first quarter of 2011, reaching index levels not seen since 2002. This means that consumers that have been contemplating buying a home have one of the best opportunities in the last decade to purchase a home. The U.S. National Home Price Index declined by 4.2% in the first quarter of 2011, after having fallen 3.6% in the fourth quarter of 2010. The National Index hit a new recession low with the first quarter’s data and posted an annual decline of 5.1% versus the first quarter of 2010. Nationally, home prices are back to their mid-2002 levels. Twelve of the 20 MSAs and the 20-City Composite also posted new index lows in March. With an index value of 138.16, the 20-City Composite fell below its earlier reported April 2009 low of 139.26. Minneapolis posted a double-digit 10.0% annual decline, the first market to be back in this territory since March 2010 when Las Vegas was down 12.0% on an annual basis.